The players are now on their final 15-minute break of the day. With 139 players remaining, the average chip stack is now just over 81,700. This will be the final level of the evening. After being the chip leader early on Day 1 action, Vanessa Selbst took some big hits to her stack, including losing a huge pot with pocket queens against her opponent's set. On her final hand, she got all in with pocket kings on the turn but her opponent had turned two pair and Selbst could not catch up. A short stacked Victor Ramdin got all in with [Qs][9s] on the J-10-x flop with two spades. However, his opponent flopped two pair and Ramdin was unable to complete his flush or straight draws and was eliminated from the Main Event. There will be two more levels of play on Day 1 action. With 170 players remaining, the average chip stack is now just over 66,800. 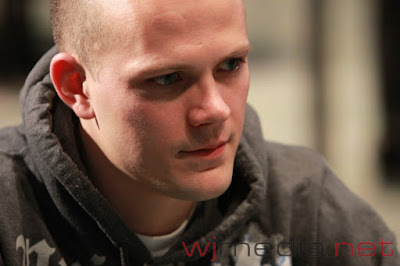 Ben Klier has been eliminated from the Foxwoods Poker Classic Main Event on Day 1 action. The players in the $2,500 NLHE Main Event are now on a 15-minute break. When play resumes, the blinds will be increased to 400-800 with a 100 ante. With 187 players remaining, the average chip stack is now just over 60,700. Bryan Piccioli has been eliminated from the Foxwoods Poker Classic Main Event after having his set of fives run into his opponent's rivered set of tens. FPC Main Event Now Streaming Live! The 211 remaining players have returned from dinner break and cards are back in the air. The blinds are currently 250-500 with a 75 ante and the average chip stack is just over 53,800. Just click "Watch LIVE Video" at the top of the page to view the live stream of the feature table. With 211 players remaining, the average chip stack is now just over 53,800. Despite finishing 2nd in the $1,000 NLHE Deep Stack event last night for $20,223, Will Failla has been eliminated on Day 1 of the Foxwoods Poker Classic Main Event on Day 1 action. The players in the Foxwoods Poker Classic Main Event are now on a 15-minute break. When play resumes, the blinds will be increased to 250-500 with a 75 ante. With 224 players remaining, the average chip stack is now just over 50,700. FPC Main Event Streaming Live! You can watch the action on Day 1 of the 2011 Foxwoods Poker Classic by clicking "Watch LIVE Video" at the top of the page. We will be streaming our feature table throughout the course of the tournament all the way up to the final table on Sunday! Amnon Filippi just ran his pocket kings into his opponent's pocket aces and was unable to improve, eliminating him from the Main Event. Dwyte Pilgrim has been eliminated from the Foxwoods Poker Classic Main Event. Vanessa Selbst has taken an early chip lead at the 2011 Foxwoods Poker Classic Main Event. She sits down with Jay WhoJedi Newnum during the break to talk about the action as well as her career in both poker and law. 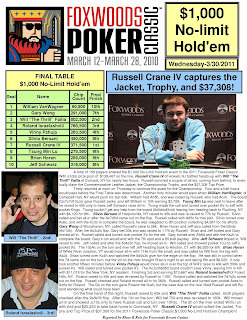 We had a total of 284 players in the $2,500 Foxwoods Poker Classic Main Event. When play resumes, the blinds will be increased to 150-300 with a 50 ante. Registration will be closed at the end of the break period. Final numbers and payouts will be posted as soon as they are available. Vanessa Selbst looks to be the early chip leader at the Foxwoods Poker Classic Main Event. After chipping up in the first two levels, she just took a monster pot with pocket jacks against her opponent's pocket nines after they saw a ten-high flop. Selbst has already increased her 40,000 starting stack to just under 150,000 with the blinds at 100-200 with a 25 ante. The players are now on their first 15-minute break of the day. When play resumes, the blinds will be increased to 100-200. There are now over 270 players registered in the Foxwoods Poker Classic Main Event. Defending Foxwoods Poker Classic Main Event Champion Luis Vazquez has been eliminated from this years Main Event. He got pocket kings and queens cracked on nearly consecutive hands to send him to the rail in level two. The blinds have been increased 75-150. There are now over 240 players registered for today's Main Event. 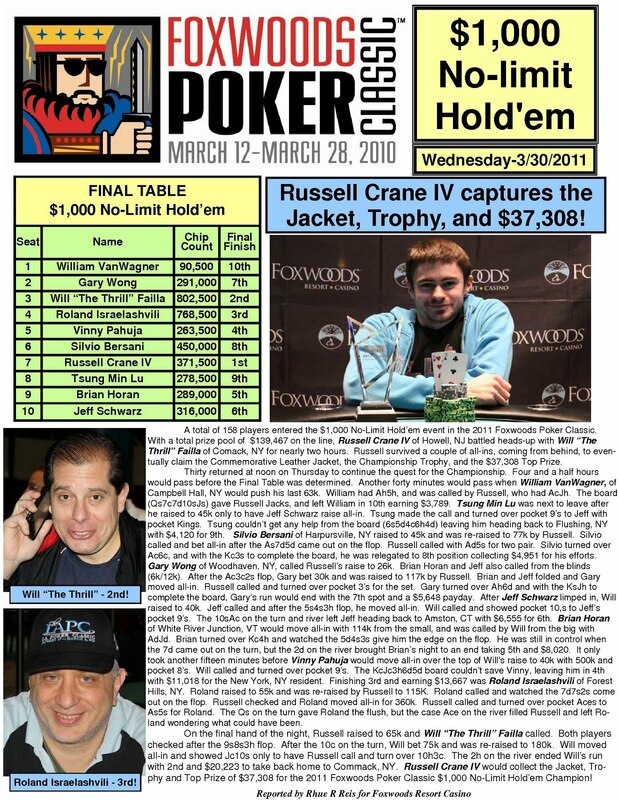 We are still in just the first level of play and there are already well over 200 players registered for the 2011 Foxwoods Poker Classic Main Event. Registration will stay open for the first few levels. 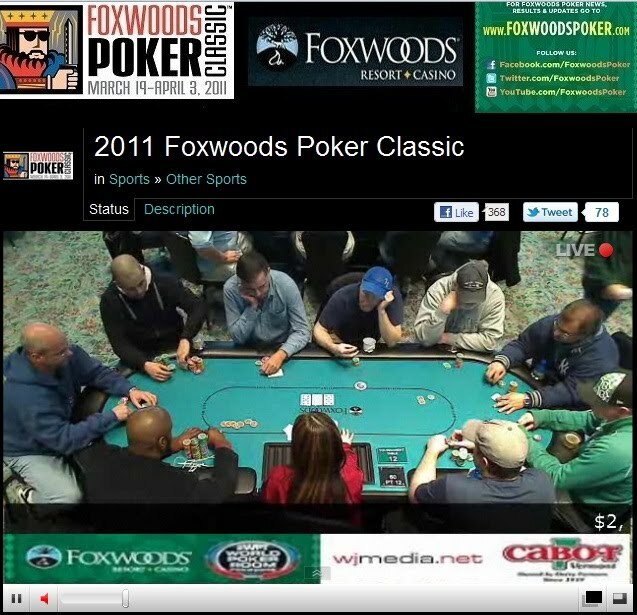 2011 Foxwoods Poker Classic Main Event Underway! The $2,500 No-Limit Hold 'em Foxwoods Poker Classic Main Event is now underway. Players are starting with 40,000 in chips and levels are one hour in length. The blinds are starting at 50-100. You can watch the live stream of the feature table by clicking "Watch LIVE Video" at the top of the page.